Hello everyone! Happy Friday to you. I hope you all had a good week. The weather here has been a little chilly and I’ve started to think more and more about the upcoming holidays, especially Christmas. I always look forward to this time of year…the hustle and bustle of getting out the holiday decorations and trying to give a cozy, festive feel to my house. As I’ve done in the past, I’m forcing paperwhites again. I always like my decorating to have kind of an earthy, natural look and, of course, I can never pass up an opportunity to have fresh flowers. Last week, I stopped at my favorite gardening shop and bought a few bulbs. I always like to use a variety of containers…some big, some small, since I never know quite what the decorating plan is until I’m arranging things around the house. You know what I mean? A lot of you have probably forced paperwhites before…there’s not really much to it. 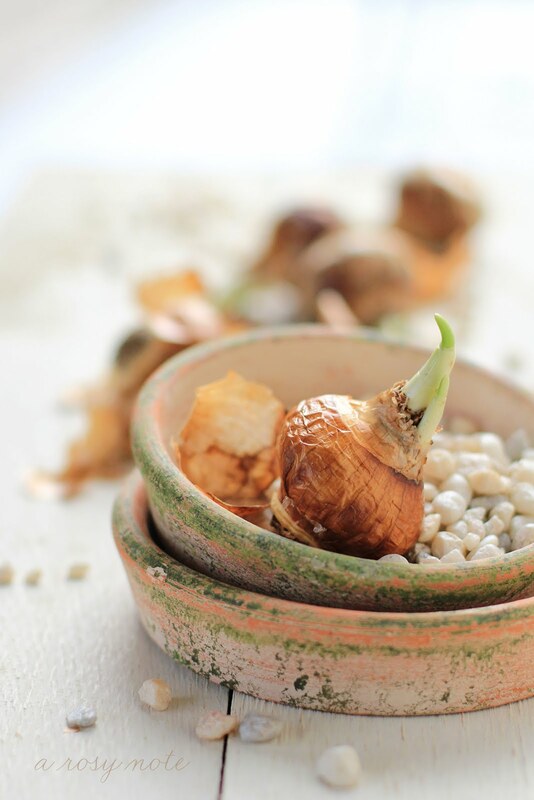 The bulbs can be planted in either pebbles or soil. I prefer soil. I’ve just had the best luck with that in the past and, I figure, it’s always easy to layer moss or pebbles over the top of the dirt if you decide you want a different look later. 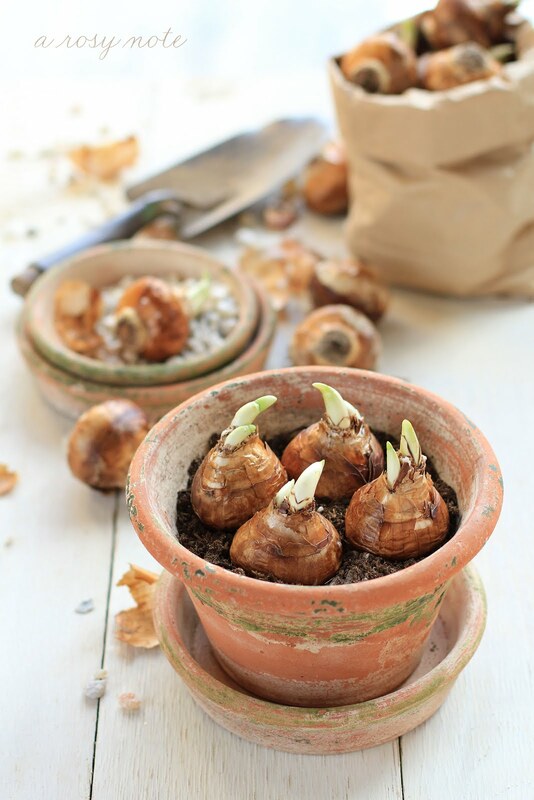 Then you just nestle the base of the bulbs into the dirt, give them a little water and put the container into a cool, dark room for a few days so that the roots can develop. Once the shoots are a few inches long, I usually start added a smidge of rubbing alcohol to the water. This helps to stunt the plants’ growth and keeps them from getting too leggy. For whatever reason, I always tend to think of my holiday decorating in terms of color themes. Do you do that too? Some years I’ll have red as an accent or green and then other times I’ll try to keep everything really neutral…that’s what I did last year. This time around, I think I might go with neutrals and little bits of green. That’s why I choose those rustic pots with green and white accents for my paperwhites. I’m trying to think of some other things I could incorporate. I love paperwhites, and Christmas decorating just isn't the same without them. This year, I happened upon gorgeous faux paperwhites and bought them. I have always planted real ones, and will supplement my faux's with real as well this year. I love your terracotta pots-perfect! I love paperwhites, the aroma as well as the look. Thanks for sharing your planting methods and the tip about the alcohol. And ofcourse I love your images, always beautiful!! I love forcing Paperwhites for Christmas, too. I'm going to try the alcohol trick this year. I've always wondered how some people get them to stay short! I love paperwhites, too. I was surprised when friend told me that she couldn't stand the smell of them, though. You are right, I think boxwood smells like cat pee. Such a bummer, because they are gorgeous, but who wants to smell that?? I forced hyacinths last year after the holidays, but want to try paperwhites this year. As always, your photos are lovely! I love your decorations with bulbs! I have always wanted to try this but for some reason I have never taken the time to find the bulbs. Your gorgeous photos are making me think this might be the year I finally do it. That's what I'm doing today as well. Some years I skipped the paperwhites because not everyone liked the strong fragrance. This year when shopping for bulbs I saw fragrant free ones, so I'm trying those out. At least they can still look beautiful! Know what you mean about the boxwood smell. It's one of those smells that people either love or hate. I fill my house with it at the holidays, so I guess I'm in the love category. Gorgeous photos, as always!!! Such glorious photos! 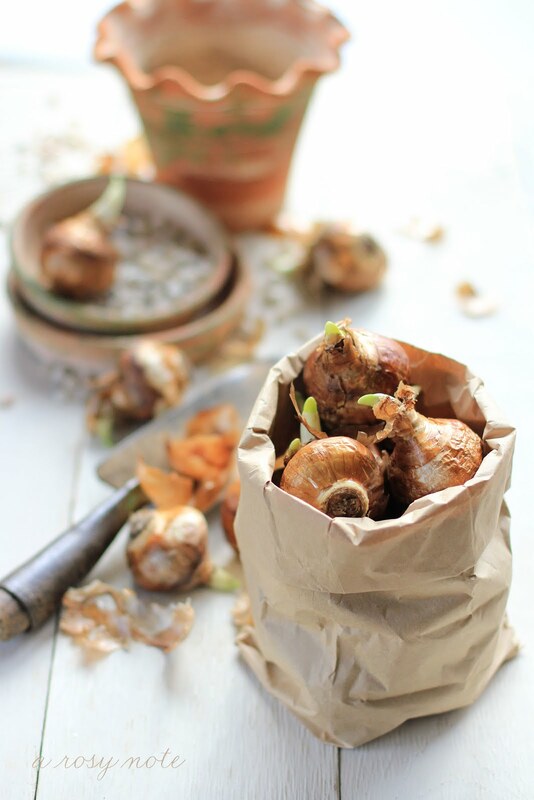 Thanks for the tips on how to force paperwhites – I can't wait to see your results! I do the same color theme every year for Christmas: red and gold. And my theme is angels and musical instruments. Never heard of paperwhites, but you made me want to give it a try. It does seem to be that time of year! Tricia — Thank you for giving me a nudge to get my paperwhite bulbs going. And I really appreciate the alcohol tip. I didn't know that. I too am planning a color scheme in my own house of whites and pale green. I usually plan my color scheme a year in advance. It simplifies things because I can pack away and mark what I know I won't use the following year. In other words, all my red and green and blue and purple and gold stuff can stay in storage this December. It also gives me guidelines for what to pick up at after Christmas sales, as well as at yard sales and in thrift stores over the year. Of course, there's always paint, too! Absolutely adore your distressed pots. I know your blooms will look gorgeous! And I hope we get to see photos. I like to force paperwhites, too, and last year I was a little off the Christmas mark, but having them in January was very sweet, too. I like the look of pebbles but I've always done them in soil…never thought to put the pebbles over. And the rubbing alcohol tip is great! Thank you! I'd love to try a color scheme…I'm going to add a pop of red to the white slipcovered furniture in the family room but my living room will be the traditional Christmas colors from my hodge podge of collecting over the last 26 years! As always, your photos are simply lovely! Today you've just inspired me to force paperwhites. Last year I planted amaryllis bulbs ( amaryllis-" to sparkle" in Greek-Latin) as a part of my green and white theme for Christmas. When I dress our home for my favorite holiday, I look for not only colors but symbols as well. White always symbolizes purity and pease while green is everlasting life. What I am going to choose this year, I don't know yet, but as same as you, I might go with neutrals again. Thank you for the inspiration and these wonderful photos of yours. I cant wait to see your paperwhites in bloom! Yes, I too am so excited about all that Chrstmas is. I have taken out our white tree for the dining area,and look forward to a real one in December for the living room. I know that however you choose to decorate, it will be stunning! Your photographs are always so beautiful and georgeous. Paperwhites are on my list to go get locally. I ordered from White Flower Farm, Amarylis– if your are interested in adding more flowers, they have beautiful varities of doubles in white, pink and red, and very bold visual impact. I always love to do this, but mine have never looked as good as you make your images in doing them. I love Paperwhites but am too chicken to plant my own. Happy weekend! Thank You for the timely reminder to get these beauties started. I waited for too long last year. I haven't done this for years…your lovely photos make me want to run out and get some bulbs! I have always wanted to try to force bulbs, But never have. Maybe this will be the year I'll give it a try. Your photos are so beautiful. I just love them. The light is perfect. I do hope you have a happy weekend. I bought a potted amaryllis bulb…and it's blooming. In fact, I bought it at half-price because it had already sprouted. Fine with me! I've had paper whites but didn't care for the smell…. and I wonder if boxwood is related to juniper. THAT smells like cat urine to me. Sure takes away from the beauty of arrangements! Your photos are so wonderful to see, Tricia. I never knew about the alcohol thing before. Great tip! I agree with you on the boxwood smell. I have quite a few boxwood bushes around here and I always think of cat pee when I walk past them. you pictures are sooo great, and I guess I also have to try it. Next week I will start my decoration for Christmas, traditionally with many old mercury silver, brown cones and some accents in white, green and red. Outstanding photos! Bet your house will be beautiful no matter your color scheme! Dearest sweet Tricia, i am really loving your holiday color theme! These photos are so beautiful and very inspiring. I am so looking forward to have a peek at your holiday decorations. Oh you know, im currently starting my miniature dollhouse kitchen and some of the ideas are inspired by you because you are just amazing when it comes to home decoration! 🙂 It's my first time working on miniature furniture and i just hope i don't destroy them! Have a lovely merry happy week! Love to you! Que fotos mas bonitas! Me encanta lo que estas haciendo! Dentro de poco comenzaré mi semana de decoración! your photos are filled with wonderful, soft, happy light. it’s addictive. Your gorgeous photos and post have inspired me to go buy some paper whites! I've never forced them before but it looks like something I can do with my girls. Neutrals with greens sounds lovely… I can't wait to see what you do! Happy Thanksgiving. 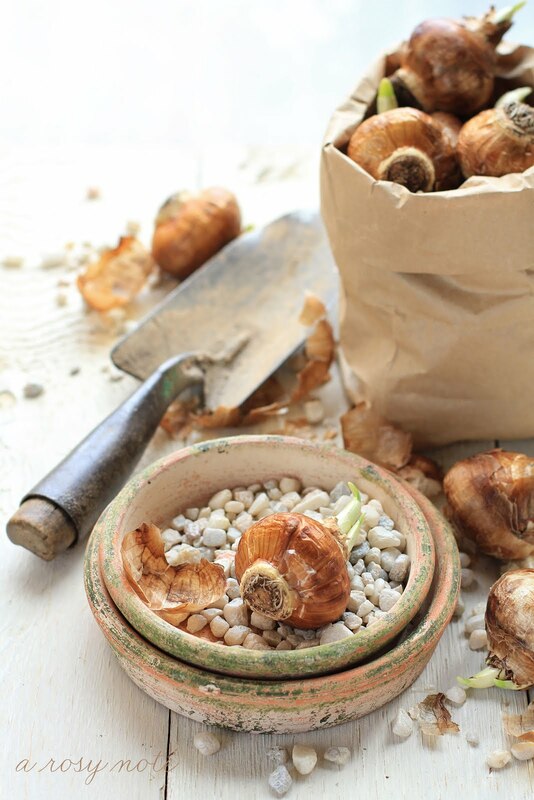 Tricia – I've never forced any kind of bulb before – do you just lay the bulbs on top of the soil (as shown in your pictures), or do they need to be covered with soil? Any tips would be appreciated! Your pictures are stunning as usual! Paperwhites are my favourites at this time of year. I must try the rubbing alcohol to see if I can stop them from getting too leggy. I always love your beautiful photos! You make an artform out of everything you do. I also love paperwhites and just bought mine today. I look forward to doing this every year too. They never disappoint. Wishing you a wonderful T-Day with your family! Just passing by to wish you a happy Thanksgiving tomorrow. Hugs. Neutral with a touch of green sounds fresh and calming. Your photos are a delight, as always. Hope these bulbs will grow and flower beautifully for you. I think of decorating for holidays in color themes too. I even have certain colors that I associate with each month of the year. I started doing it as a kid and it stuck. thank you – solange had a tutorial similar – she used an old silver dish…I wish I had a pot like yours! lovely!! This is something I always mean to get round to at this time of year…but never do!! Shame on me! Yours are already looking pretty, peeping out of their bulb-casing like that! This looks like fun! Might give it a try…Thanks! Hi Tricia! How is my favorite photographer doing? I know what you mean by color schemes during the holidays. This year I'm trying gold and silver for the first time. Wish me luck! Trish, your photography is such a beauiful thing to behold! You've made the paperwhite bulbs look like the work of art that they truly are! I come here for photography inspiration and you've done it again! Just got a new portrait lens and I'm hoping to be able to do use it for household items and food to make things look more interesting. Love the depth of field. I'm so impressed with these photos. You are truly a wonderful photographer. Glad to see your blog continues to be such a success. I agree with the comments that your photos are absolutely gorgeous! You are so talented! I hope your holiday decorating went well. I look forward to seeing your pictures. Hi Tricia! I've missed stopping by to see you. I took a few months break from blogging, mostly due to some physical issues. Your blog is always such a pleasant and peaceful experience to come by to see. I imagine if I met you in person, I would feel those same feelings of peace and beauty. What a wonderful gift you are to blog land. Hope you are enjoying this holiday season with your family. Please stop by to see me, since I finally put a new post up after being gone for a few months. I have never heard of using the alcohol before. Neat trick. Thank you for that nice little reminder on the paperwhites I stored away for the winter, I have to get them decorated again and maybe they will bloom again, I keep my fingers crossed for that. This year I am changing my colour scheme for Christmas for the first time. I always decorated a lot with green and red and gold but somehow that always felt too much over the past years. This year I decided to decorate in white, silver and natural materials. Will put some photos online soon. Hope to see photos of your home with Christmas decor. Can't wait! I love the look of paper whites, but they actually smell really bad to me. 🙁 do you notice a smell from them? Can you tell us where you got your preserved boxwood wreath? I'd love to purchase one, too! Hi: I just discovered your blog through My LIttle Bungalow. YOur images are wonderful, and the paperwhites caught my attention right away! I was just talking to some other bloggers (do you know Hometalk?) and it seems adding vodka to the water will really help keep the flowers upright as they get taller. Mine are enjoying a cocktail right now! I've just liked you on FB, so if you follow me you can see the results. I'll be back….